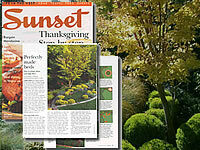 Featured in November, 2004 issue of Sunset Magazine, Terra Bella Landscaping shows what it takes to design and build Perfectly Made Beds. Terra Bella Landscaping has also been featured in the Santa Cruz Sentinel, Goodtimes and The Seascape. Owner, Nikos Lynch has contributed to articles such as Getting Started in Your Garden by Angela Signorelli, and Pondless Waterfalls by Andrea Gifford. Mr. Lynch has also been a featured speaker at the central coast Home and Garden Expo for the last 4 years, speaking on topics such as Gardening with Feng Shui and Fall Color. In 2013 Terra Bella Landscaping won the people's choice for best landscaper according to the GoodTimes readers poll. In 2009 Terra Bella Landscaping won Xeriscape for a rainwater system in Los Gatos, CA. This same project also won a Custom residential installation award. Terra Bella Landscaping won the Smart Garden contest in 2008 for low water usage landscaping, sponsored by the Master Gardeners Program and Soquel Creek Water district. This project also won a Small Commercial Installation award. Terra Bella Landscaping was recognized with an award in special effects lighting and large residential installation for a home in Capitola, CA. In 2007 Terra Bella Landscaping received an award for a custom residential water feature installation we did at a private home in Aptos, CA. 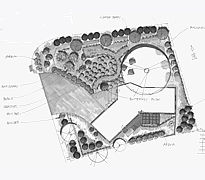 Terra Bella Landscaping won a Xeriscaping award for our native habitat wildlife food source garden in Capitola, CA. 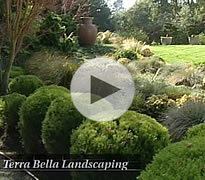 Terra Bella Landscaping was also awarded the Special Effects Award 2004 for the Stienback residence in Santa Cruz. The Special Effects Award is given once a year to landscape companies who show outstanding creativity and innovation. The Seascape issued 2003 Beautification Awards and Terra Bella Landscaping was awarded: Winner of the Excelsior Award. We are excited to have received this wonderful award and want to thank the Seascape as well as our customers who make it possible for us to do award-winning projects! Terra Bella Lanscaping owner, Nikos Lynch, is the President of the Central Coast California Landscape Contractors Association (CLCA). CLCA is a non-profit trade organization of state licensed landscape and landscape-related limited specialty contractors. CLCA's membership, which totals approximately 2,500 individuals, also includes suppliers to contractors, landscape architects, educators, public officials, and students.